The building renovations on the 900 block of Main Street are nearing completion and the two new businesses will move into the spaces in January 2015. 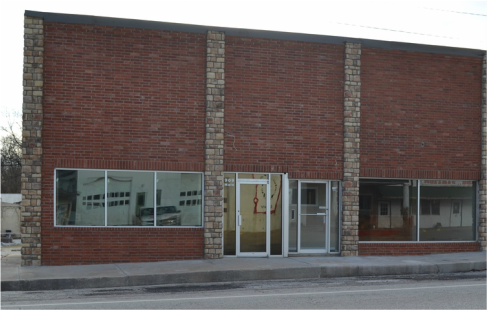 Cassville’s Main Street got a new face last week on the east side of the north end of the 900 block on Main Street when workers completed the front and north side of a forty foot front and side of the building owned by Robert (Bob) Bishop and Carolyn Bishop, his wife. The Bishops purchased the building from Carolyn’s mother’s estate when she passed away. According to Carolyn, the work to the outside was just part of the total renovation to the building. Inside, the Bishops had the ceilings, lighting and bathrooms redone as well as fresh coats of paint and new countertops. On the exterior of the building, a brick facade was put on the front. They also put in new columns, windows and doors. Once the work is completed, the whole block will also have new asphalt on the parking lot. The building, which is divided into two sections, will house a chiropractic office and a copying service in mid-January and early-January, respectively. The disastrous fire which destroyed the entire Cassville business district in April of 1893 destroyed the old LeCompte home which was owned by L.D. Oxford and the large Oxford barn which was located in the 900 block where the Bishop building is located. Then in 1896 the Cassville-Exeter railroad was built which accounts for the odd shape of the Bishop building on the north side at the east end of the building. On February 4, 1939, 75 years ago, the late Fred Meador, who for many years owned the Meador Hardware, sold the Bishop lots to John Ray, one of the owners of the Cassville Democrat. Ray died in 1854 and his widow sold the lots to Rusty Morgan on June 10, 1954, who later sold it back to Mrs. Ray and her daughter, Elizabeth Orton in 1967, when Mrs. Orton sold it to J.B. and Verna Mae Nations. Nations, Carolyn’s mother, owned the building until the Bishops had the deed turned over November 1, 2012.